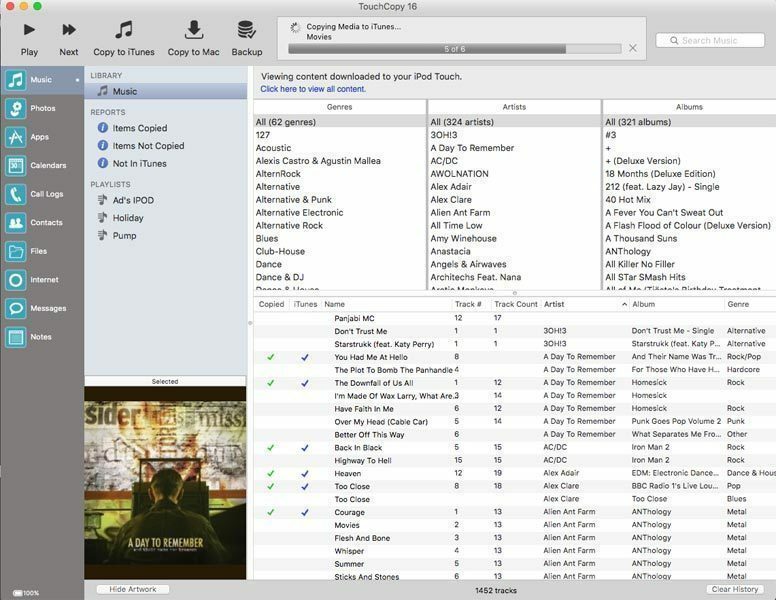 TouchCopy 16.28 – Backup music and other media from your iPod and iPhone. Save your Text Message, iMessage and WhatsApp conversations to your Mac. Save Voice Mails from your iPhone to your Mac. View and copy Calendars, Contacts, Notes, internet history and more to your Mac. Powerful iPhone, iPod Touch and iPad File Manager allowing you to copy files to and from your iOS device. Includes a comprehensive help system and friendly email support. Next story iCalamus 2.19 – Desktop publishing solution. Previous story Filter Forge 8.004 – Generate textures, create visual effects, and more. Carbon Copy Cloner 4.0 – Easy-to-use backup/cloning utility. TimeMachineEditor 4.5.4 – Change the one-hour interval of Time Machine backups. DiskCatalogMaker 7.2.7 – Catalog your disks.